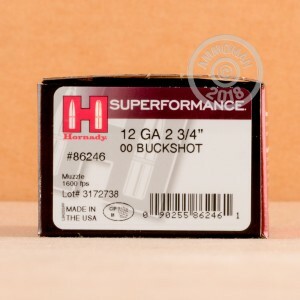 For buckshot ammunition that functions great in semi-auto and pump action shotguns, Hornady's 12 Gauge Superformance 00 Buck loads should be at the top of your list! These 2 3/4" shells are loaded with 8 pellets of lead shot. The wad used in this product is Hornady's "Versatite", which was designed for tight, consistent patterns with each shot. With an impressive muzzle velocity of 1600 feet per second, the ballistics of the Superformance ammo are exactly what you would expect from a leader like Hornady. 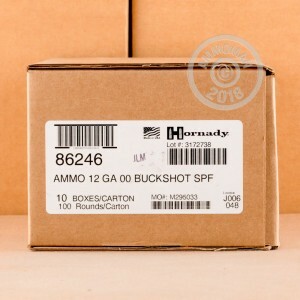 You will receive your 10 rounds of 12 Gauge 00 Buck ammunition, brand new, with fast shipping. 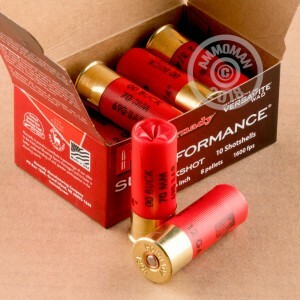 Hornady Manufacturing Company was founded by Joyce Hornady in 1964. Today, the company is still going strong, providing hunters and shooters worldwide with high quality ammunition. They are headquartered in Grand Island, Nebraska.